The message Sunday from 60 Minutes echoed that of a seasoned investor group only days earlier: Mindfulness is here, now and mainstream. “We at Bridge Builders Collaborative are impressed with eMindful's cost-effective, scientifically demonstrated mindfulness-based programs, their experience in the corporate market and their ability to have a positive social impact." said Austin Hearst. On Sunday’s edition of the long-running news program, CBS featured CNN’s Anderson Cooper in a report on mindfulness meditation’s growing popularity, and the many health and performance benefits for those who practice it. Earlier this month, a prominent investor group provided growth capital to eMindful Inc., an award-winning company serving Fortune 1000 employers and individuals with mindfulness training through live, online classes taught by leading mindfulness experts. This latest investment in eMindful was led by Bridge Builders Collaborative. One Bridge Builders partner is Austin Hearst, a media executive, film producer, and member of the Hearst Corporation's Board of Directors. Mr. Hearst also has joined eMindful’s Board following the $3.4 million funding round. Other participants in the round include One Earth Capital, Serious Change, the Bowana Foundation, Jeffrey C. Walker, and the 1440 Foundation. eMindful is the only company delivering evidence-based wellness and disease management programs to employers, insurers and consumers through live, online classrooms, where participants can see, hear, talk and chat with their instructor and other members. All of eMindful's programs incorporate mindfulness practices. Since 2007 eMindful has received industry and scientific acclaim as a way to reduce stress, smoking, overeating, chemical dependency, pain and other behaviors that contribute to chronic illnesses for millions of Americans. eMindful’s results have been validated by research led by Aetna and Duke Integrative Medicine, and the company has trained thousands of participants from around the world. Early customers include Aetna, Humana, Healthy Business Group, Florida Power and Light, Kaiser Permanente, the national Blue Cross Blue Shield Association, and the State of Arizona, among others. The National Business Group on Health in 2012 recognized Aetna and eMindful for innovation in addressing employee stress, and the company received a “Florida Companies to Watch Award” from a state business-university consortium. 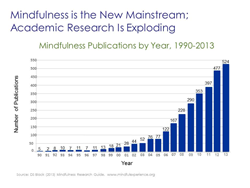 Major media interest in mindfulness has grown alongside a dramatic increase in scientific research. Peer-reviewed articles in scientific publications have grown more than ten-fold over the past decade. eMindful works with experts from esteemed organizations including Duke Integrative Medicine, the NeuroNova Centre in Toronto and the University of Calgary in designing and delivering mindfulness-based programs. Among the company’s popular courses are Mindfulness-Based Stress Reduction® (MBSR), developed by Jon Kabat-Zinn at the University of Massachusetts Center for Mindfulness, Mindfulness at Work®, QuitSmart® Mindfully and Weight Balance for Life.